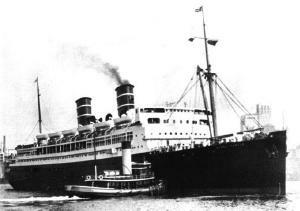 The SS Morro Castle was ‘the’ ship in her line of work. Built in 1930, the cruise ship was designed for travel between New York City to Havana. Owned and operated by the New York & Cuba Mail Steamship Company (or more commonly known as the Ward Line) the Morro Castle and her sister ship the Oriente, were shamelessly marketed as the safest ships afloat. And in a way it would seem so, or at least as a safe as a ship could be. Her lifeboat capacity provided enough seating for 2,000 people, although the ship never carried that many people. ‘Smoke detectors’ had also been implemented, but were not extended to many public rooms. At Morro Castle’s maiden voyage she was sent off with great fanfare and broke a record, reaching Havana in almost 59 hours. The Morro Castle’s captain was a reliable sort and very popular with the passengers. An Englishman by birth, Robert Willmott resided in Long Island as an American citizen. He was very proud of the Morro Castle and had previously brought her through a hurricane. Still things weren’t running as smoothly as it would seem. Willmott was experiencing health problems and on August 25th, 1934 while on a voyage he suffered what may have been a heart attack. Two days later a fire broke out in the cargo hold and the crew proved inept at putting out, although it was eventually extinguished. Willmott harbored the fear that someone had set the fire. There was a person Willmott should have been, and may have been, wary of. That was the chief radio officer, George Rogers. He had a criminal record and would continue to display the actions of a person mentally disturbed. On September 1, 1934 the Morro Castle was taking a Labor Day cruise and had a larger than usual complement of passengers. 259 with 59 more awaiting in Havana. Three days later the Morro Castle arrived in Havana. By the 5th a hurricane was moving across the ocean, behind the Morro Castle. Ahead of the ship was a nor’easter. Willmott continued to have health problems and was taking his dinner in his cabin. At 7:30 PM 4th Officer Howard Hansen requested the doctor’s presence. Willmott had had another attack. The doctor arrived and gave Willmott an enema, leaving soon after. A little while later Chief Officer William Warms found the captain dead. Hansen and Quartermaster Samuel Hoffman made amateurish efforts to revive Willmott, but the doctor soon confirmed that Willmott was beyond help. The doctor stated that Willmott died of a heart attack, but people would later question this. With the captain’s death, command passed to the less likable Warms. In the smoking room at about 2:45 AM a passenger told a steward that he smelled smoke. The man led steward Daniel Campbell to the 1st Class Lounge, but Campbell smelled nothing. The steward left, passing by the Writing Room. There he seen smoke coming out of a locker. Opening the door revealed an uncontrollable blaze that appeared to be the work of a chemical. Campbell shut the door and raced to find help. The steward and night watchman Arthur Pender exchanged a few words before hurrying off to put the fire out. In the meantime another night watchman went to report the finding to the bridge. But as Pender and Campbell continued to dump water on the flames, it persistently grew. Theirs was a losing battle as the blaze spread to the Promenade Deck. The ship was moving at 20 knots with the wind urging the fire on. The crew awoke passengers and informed them of the fire, who in turn put on their lifebelts and headed for the boats. However, access to the boats was cut off for many as the fire raged on. Some boats were even incinerated. Although they had been ‘inspected’ about a month earlier, many lifeboats were ‘glued’ to their davits by layers of paint. The few boats that were launched, usually went with so few people aboard that they were unmanageable and forced to drift in the stormy weather. People trapped on the stern began jumping overboard. The ship was still moving and crew tried to dissuade the groups from jumping as they would be pulled down by the propeller. They were ignored. The people that were ‘lucky’ enough to get a lifebelt were much of the time knocked unconscious when they jumped overboard, the vest banging into their chins. On the bridge when it became apparent that nothing further could be done, Warms surrendered the ship to the fire, retreating to the forecastle with others. He had the ship stopped and anchored. In the radio room, George Rogers picked up a conversation inquiring about a ship on fire near the Jersey coast, but didn’t inform them that it was the Morro Castle. During the silent period Rogers prepared to send an SOS, but was told to be quiet on the other end. Soon orders came from Warms to send an SOS, but just as the call was sent the radio batteries exploded. Rogers and his assistant later made it to the safety of the forecastle. The SOS was indeed received and a Coast Guard cutter was dispatched, as well as a patrol boat. A ship near the Morro Castle, the Andrea Lukenbach, heard the SOS and made for the distressed vessel. Another ship, the Monarch of Bermuda, followed suit. A fishing vessel, the Paramount, rescued about 67 people from the water. The crew of the Luckenbach began lowering lifeboats, putting their own lives at risk in the bad weather and growing waves. The Monarch of Bermuda and the City of Savannah also sent out their lifeboats. One of the Monarch’s boats offered to take the men on the forecastle off, but the crew declined. Warms wanted the remaining people on the stern taken off first. Already the survivors and dead were beginning to drift away from the disaster site, some towards shore. Those that washed up on shore were rescued by awaiting people. Later rescue attempts at sea had to be called off with rough weather coming on. The Coast Guard cutter, Tampaarrived and agreed to tow the Morro Castle. But the burning ship was anchored and without power, so the chain had to be sawed through. The Tampa took the remaining crew off of the Morro Castle and tried towing the vessel. But the once grand lady was unruly in the rough weather. Finally she broke free. The towline snapped and entangled the Tampa‘s propeller. The cutter’s anchor had to be dropped as she nearly beached. 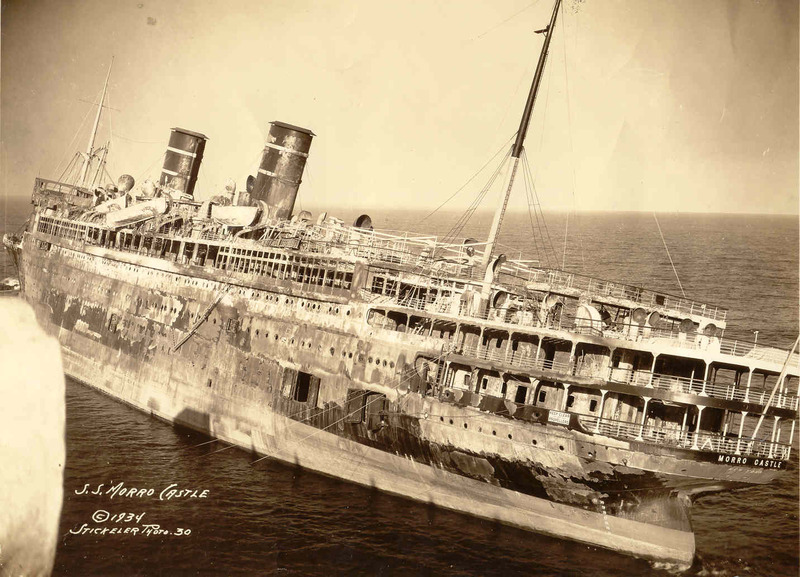 The Morro Castle on the other hand headed for Asbury Park, New Jersey, where she beached on September 9th. In the end no one is really sure what caused the fire. Some evidence seems to point to arson. Rogers later became a suspect, but nothing was ever proven. 134 people died because of the disaster. Source: Hicks, Brian. When the Dancing Stopped: The Real Story of the Morro Castle Disaster and Its Deadly Wake. Another great article. Beware the “safest” anything! I agree. They seem to have a habit of becoming risky. Good job JG. On another note, I am writing an article on Dr Ballard that I think will be a good fit to the article you are writing. We will use the two articles to end the observance event. Thanks again and keep up the good work. Sounds good, I hope “The Elusive Lady” turned out well. It did. We will schedule it for posting on April 15, at the same time they started the memorial service on the Knorr. Thank you … great job. Thank you! I look forward to whatever else you’ll have up on the 15th. Another interesting post! I had never heard of this. Thanks! Neither had I until a few weeks ago. I came across the story accidentally. Thanks for reading. Fascinating article!! I’m glad I found your blog. Thank you! I enjoy the photos you have up on your blog too. What a waste of a beautiful ship. I’ve seen pictures and it was so beautiful inside. I wonder if any of the survivors are still alive? They would have been children at the time but it’s possible. It was indeed a beautiful ship. There were a few survivors still alive in 2007, who were very small at the time of the tragedy. Thanks for your comment! This caught my eye as I was exploring your blog. I grew up in Asbury Park and the Morro Castle was still frequent conversation in the 50’s and 60’s. Now that’s interesting! Such a terrible way to end a vacation though. Here it is the middle of the depression and your ship goes up in flames. And not to mention the 134 who died. Thanks for your comment. Having spent my childhood summers in Seaside Park, New Jersey, the Morrow Castle story was still very much alive in people’s memories and stories. Such as standing on the boardwalk and seeing people jumping off the ship. In the 1950s, the disaster was still fresh, as was that of the airship Hindenburg at nearby Lakehurst. Thank you for your fine blog and the memories it stirs–along with depictions of times yet earlier. So glad you enjoyed. I found your comment very fascinating to read through. Thanks for taking the time to share, I appreciate it. You’re very welcome. And please keep the pictures and the articles coming.